Legally, Paras Nath doesn’t exist. At the age of 52 he is still clueless about where he hails from. Nath was barely five years old when he began toiling hard to grow sal trees in the forest. “Even my parents were not able to trace their antecedents, but they too spent their life planting trees here,” he says resignedly, sitting in front of his thatched house. Nath’s is not an isolated case. About 26,000 people in the forests of Maharajganj and Gorakhpur districts of Uttar Pradesh (UP) are facing a similar identity crisis. They are known as the Van Taungiyas — a legacy created by the repressive British forest policy and perpetuated by an even more exploitative Indian forest department (FD). Today, the community is facing eviction from the very forests it has nurtured and regarded as ‘home’. Hence the frantic search for its roots. Ironically, the Van Taungiyas have been disowned by the government: while the FD dubs them as illegal settlers, the revenue department too doesn’t acknowledge their existence. The lucky few among them get to exercise their franchise, thanks to a local politician on a vote bank-tapping spree. up rates the sal forests of the two districts as its best and richest green cover on the Indo-Nepal border. These tracts, now constituting about 25-30 per cent of the districts’ total forestland, are conservatively estimated to be worth Rs 800 crore. This does not include the commercial harvesting of the forest since the early 1920s when plantation started. To be precise, it was in 1922 that the British government started growing sal trees (see box: A system that delivers) around the area where Nath’s ‘illegal’ house stands today . It used labourers from regions as far away as Burma (present-day Myanmar). 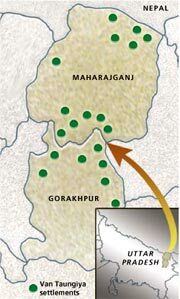 Significantly, the Gorakhpur forest was in the vicinity of timber markets. Official papers mention that the British government saw this as an ideal export proposition and, therefore, opted for plantation of high-value species like sal . Cheap and easily available labour made the task of the authorities easier. People such as Nath’s ancestors perceived this to be an escape from slavery. They took the bait and became Van Taungiyas — a decision whose repercussions can still be felt. The Sword of Damocles hanging over Nath has left him yearning for a ‘legal identity’. Sadly, his father died with the same wish unfulfilled after his fifth change of residence inside the forest (the taungiyas are constantly on the move). Nath is currently living in a settlement of forest dwellers called Surampur. “When people listen to the story of the taungiyas the first question they ask is: do they exist?” says Krishna Mohan, a social worker who is now fighting a legal battle for the community’s rights and home. In the inital stages, the British FD was so impressed with the taungiyas’ commitment that it recruited a forest ranger to educate their children. There was a territorial staff-run primary school in almost every centre. Anti-malaria drugs were also distributed during disease-prone months. In another allowance, they were permitted to graze a limited number of cattle. Besides, the FD also provided them with free fuelwood, construction material and irrigation facilities. In the 1920s and 1930s, the taungiyas could do business with their surplus crops. To be sure, all working plans till Independence supported the taungiya scheme. “Range officers should maintain adequate contacts with taungiya cultivators to win their confidence and see that they are not being harassed…either by local petty range subordinates (or) outsiders,” observes a document. Its favourable outcome saw more people being hired for the purpose. According to an estimate, during the 1940s and 1950s there were 15,000 people working in the planted forests. After Independence, the UP government continued with the system but with slight modifications. The FD used to divide the forest into patches measuring about 30 hectares (ha) each and handed them over to private contractors to clear-fell it for commercial use. After 1983, the UP State Van Nigam, a government body, performed this task. Subsequent to its being cleared, the forest was leased out to the taungiyas for plantation. In 1983, the situation took an ugly turn. The FD asked the taungiyas to sign an agreement, according to which they could be evicted after five years of plantation. The system of hereditary transfer of leased land was also done away with. The community members, however, saw through the FD’s ruse. They refused to ink the pact, sensing that it was a ploy to evict them. The taungiyas ’ apprehensions were not misplaced. The FD formally terminated the plantation scheme in 1983 and issued them eviction notices. “The FD had to discontinue the scheme despite its success as the taungiyas were involved in illegal operations inside the forest and some political parties were using them for non-forest activities,” alleges Vikash Verma, conservator of forests, Gorakhpur division. The FD claims that it has incurred a loss of Rs 8699 lakh in the last 20 years, and a further amount of Rs 123 lakh is being lost every month due to encroachment by the taungiyas. The 1983 decision spawned a complete disruption of their lives: their access to the forest was banned, fuelwood extraction was declared illegal and agriculture tracts were taken over by the FD. Jayaram Prasad, head of Surpar settlement, says: “When the forest was accessible to us, there was extra income. But now forest staff herd us out.” Even schools were shut down. “This was necessitated because the scheme was discontinued and the taungiyas were no longer bona fide labourers,” says Verma justifying the closure of the schools. “A whole generation of our children is illiterate now,” laments Ram Ashraya, a community member. To shore UP its defences, the community formed an organisation called the Van Taungiyas Vikas Samiti (VTVS) and decided to retain the land under their control for agriculture. In 1987, the face-off between the forest dwellers and the FD reached a flashpoint. While forcibly evicting the taungiyas, armed forest officials shot dead two of them. Though the officials are serving life terms, the FD still dubs the incident as “skirmishes”. The FD is also said to be lodging cases — from felling to smuggling of timber — against the taungiyas at the drop of a hat. VTVS filed a public interest litigation petition in the UP High Court (HC) in 1991 because the harassment continued unabated. The HC stayed the eviction of the taungiyas from the forest. Upon the court’s intervention, the FD had chalked out a Rs 108-crore resettlement plan to shift them outside the forest. But the revenue department was not ready to spare any land for the purpose. “The proposal has not made any progress,” admits Verma. 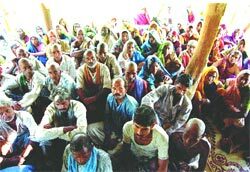 On December 14, 2001, the then forest minister of up, Rajdhar Singh, called a meeting of legislators, district magistrates (DMS) and forest officials to resolve the taungiya tangle. He wanted the community settled outside the forest or in villages near forests. It was also proposed that the taungiyas be given revenue village status. But the DMS rejected the plan. 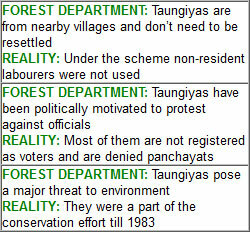 The FD said that the Union government’s permission was necessary to give forestland to the taungiyas . This, it averred, would not be easy. Old official records lend weight to the taungiyas’ assertion. They show that the scheme encouraged only resident labourers to participate. The revenue department, meanwhile, is unbending in that it has refused to form panchayat institutions in the settlement. It maintains that legally the community doesn’t fall under the revenue set-up. According to the state government, eviction is the best option. “The taungiyas violate the forest conservation act. In view of the Supreme Court’s ban on non-forest activities inside forests, the state government may be charged with contempt if it does not rein in the taungiyas ,” says Verma. Unfortunately, the Union ministry of environment and forests has backed the state FD to the hilt. “The taungiyas are in no mood to listen to any FD official now,” says Mohan belligerently.